I live with my boyfriend in Austin TX and we're both working on getting teaching certifications. We want to teach English and live in different nations! (⌒‿⌒♡) He's like the Mamoru to my Usagi, which we've cosplayed before haha. He's so compliant. ^O^ He even sits through Sailor Moon Crystal with me and is following along! I use a lot of emoji and like to blog and use the internet for cute graphics when I'm not working, taking walks, or hanging out with friends. I love to see an active Sailor Moon community so I hope we can all be friends! My name is Erica, most people on here call me Hikari. I want to extend a warm welcome. I am a member of the GC welcome squad. I am also working on getting my teaching credential here in California and am hoping to teach English in Japan. Do you have a favorite senshi or villain? What about version of Sailor Moon, do you have a favorite? I really like the live action (PGSM) and the musicals (Sera Myu). A good place to start on here is the General SM discussion, where you can find all things sailor moon. Oh have you been watching crystal? what are your thoughts? Well that's it for now. I hope you can find a lot to do. We have a lot of fun things to do here on GC. If you ever wanna chat, or have a question, my inbox is always open. I'm hoping to make it to Japan also! How cool. ( ´ ▽ ` )ﾉ I'd say my favorite senshi is Chibi Usa, though I relate to Usagi the most. I also love Sailor Mercury.~ I guess my favorite version of Sailor Moon is the manga, but so far Crystal is staying so loyal to the manga! It's a little hard for me to pick which is the best version. I love Sailor Moon R so much too... I really enjoy Crystal a lot though and have been keeping up with it every episode, I just watched the new one this morning! Also I think I should mention, my other favorite anime are Neon Genesis Evangelion, Madoka Magica, Pokemon, Digimon Adventure, Tottoko Hamutaro, Dragonball, Shin-chan, Kuragehime, Tokyo Mew Mew, Di Gi Charat, Cardcaptor Sakura, and other "classic" ones. I also love Fruits Basket and Death Note. ah my anime list is really long (/ω＼) I also like video games, Kingdom Hearts and the Final Fantasy series are great. I play all the Pokemon games and am soooo excited for ORAS. EDIT: Also I think it's worth saying, I love electronic music a lot. If anyone wants to listen to my favorite music I perfected a pandora station that plays everything I love. I also have a photoblog that I use pretty regularly, if anyone likes cute Tumblrs mine is linked right below my posts. Hi Bunny! OMG that is the cutest nickname ever I'm Alyssa. Welcome to GC! Are you wanting to teach English as in literature or language? English Literature is my favorite subject But I think traveling to different countries and teaching the English language is so fascinating! I don't have the patience to be a teacher, unfortunately, even though I'm typically a really patient person xD. Who's your favorite Sailor Moon Villain, and why? My favorite would have to be Saphir, because he ended up realizing his errors and I just have soft spots for villains who change for love. YAY YOU LIKE FINAL FANTASYYYYY!!! Anywayyy, I hope you enjoy your time on this site, and if you have any questions or just want to chat, feel free to send me a PM! 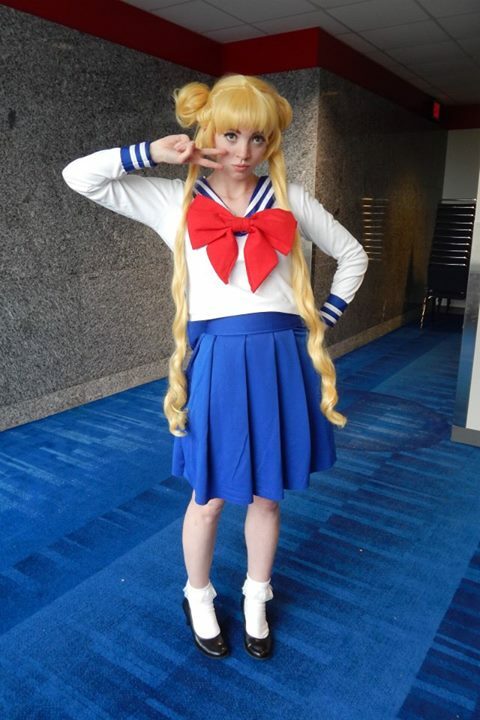 I have other pictures including my boyfriend as Mamoru, but this was my basic cosplay. I'm soooo proud of it honestly, my friend and I sewed the fuku together and I handmade the wig. It's probably my favorite cosplay I've ever done, I think it makes me look like a little doll haha. (/ω＼) It was such a good moment when it all came together!! I might be with you on Saphir! I also like Queen Beryl honestly, she's just so "classic" and I love that first arc! I've never played the 13th Final Fantasy but maybe I should! >w< I work a lot these days but sometimes I do have time for video games, I've been replaying Pokemon in my downtime. And it's so great you mention Disney because I'm soooo crazy about Disney parks. My boyfriend and I are going to Disney World next year and are in the process of saving up for it. I want to go to Tokyo Disney the absolute most though ah!!! THAT COSPLAY IS SO BEAUTIFUL OMIGOSH YOU LOOK SO AMAZING!!!!!!!!! Can I be you, please? Going to a Disney Park is my dream vacation. It looks so magical and I'm just a sucker for all things magical xD. I hope everything goes as planned for you! Very nice to meet you Bunny! I am Comet! I really hope you are enjoying Crystal! Have you watches all the seasons of the original sm anime? What was your favorite season? Welcome, Bun-bun, to The Galaxy Cauldron! My name's Maxis Aerian, the Maxis Scout of industry and technology, and the first of many! I happen to be a fan of the Fallout Series, Bethesda-Era; Minecraft; and Sonic the Hedgehog. I'm also a clean brony and moonie. Ahhhh oh my gosh you're all so nice! I just got a new computer so I need to import Photoshop somehow but I'd love to make some more avatars once I'm started up. (｡´∀｀)ﾉ Making avatars has been a huge thing for me for a long time omg. And thank you for all the niceness about my cosplay, I'm probably gonna break it out again for Halloween so maybe there will be more pictures ahh! Suny, if you ever want a bunch of cute pixels to use I resource Engram-Pixel the most! See how cute! >w< I have a huuuuge folder of these that make things so much cuter. I love MLP:FIM so much, I really do omg. I cosplayed Pinkie Pie once upon a time, she's the most like me for sure. I've slowly collected a lot of ponies over time. they multiply! Thank you! :bunnyhappy:Oh, cool! I hope you have a good time.